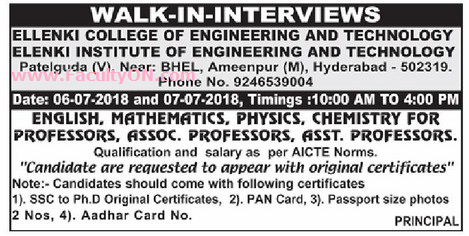 Ellenki College of Engineering & Technology, Sangareddy has advertised in the EENADU newspaper for recruitment of Teaching Faculty- Professor / Associate Professor / Assistant Professor jobs vacancies. Interested and eligible job aspirants are requested to walk-in on 06th and 07th July 2018. Check out further more details below. About College: Ellenki College of Engineering & Technology was established with the sole objective of meeting the long felt need of a centre of scientific and educational research, which would meet the challenges of the present and the future technical advancements of the fast changing world. Since then, the college has grown leaps and bounds and has made a strong impact in the field of education across the state. How to Apply: Interested and eligible candidates are requested to attend the Walk-in interview along with CV, originals & copies of certificates (SSC to Ph.D originals), PAN card, Aadhaar card and 02 recent passport size photo to walk-in address given below.